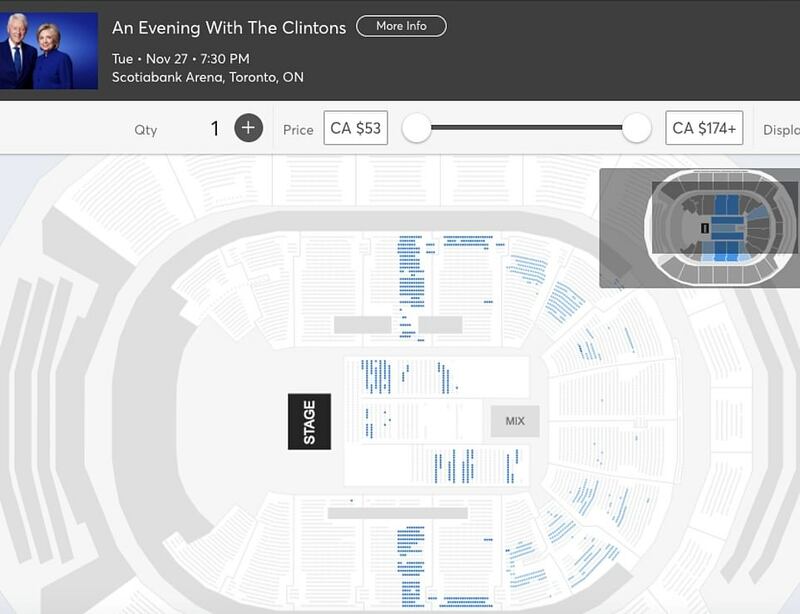 Bill and Hillary Clinton are apparently struggling to sell tickets for their stadium speaking tour across North America... and have resorted to flogging them for half-price on Groupon. The former president and presidential candidate are offering fans a once in a lifetime chance to spend 'An Evening with the Clintons' and "experience a one-of-a-kind conversation with two individuals who have helped shape our world and had a front seat to some of the most important moments in modern history," and all for less than $100. 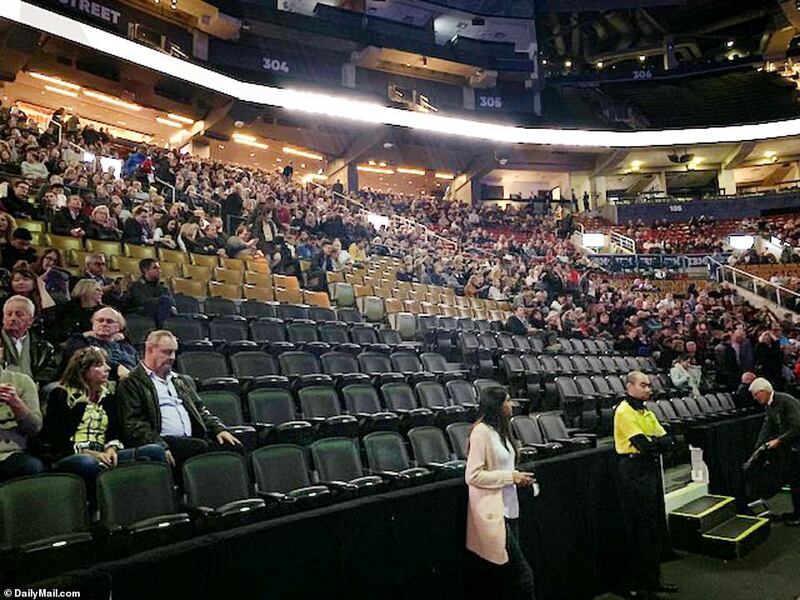 However, it appears the enthusiasm the couple drew on the 2016 campaign tour has died down and they now find themselves preaching to half-filled stadiums. 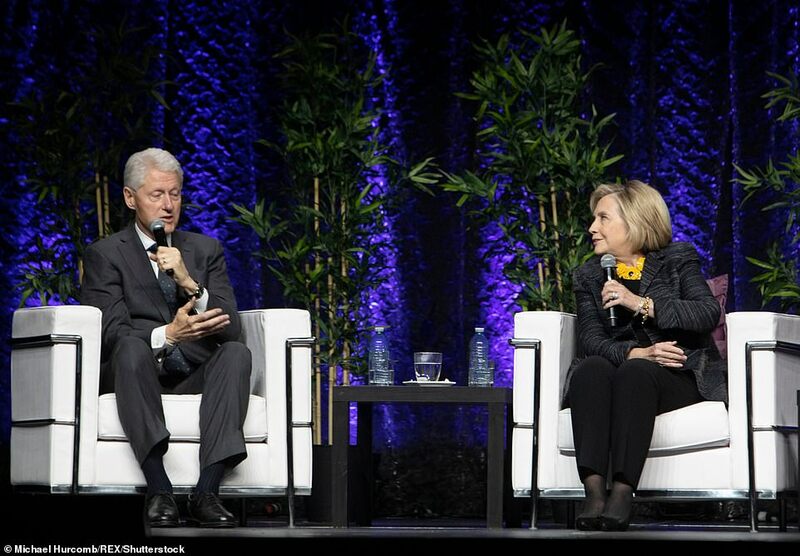 Bill and Hillary Clinton have been forced to resort to selling half price tickets for their 13-city tour on Groupon in a desperate bid to put bums on seats. 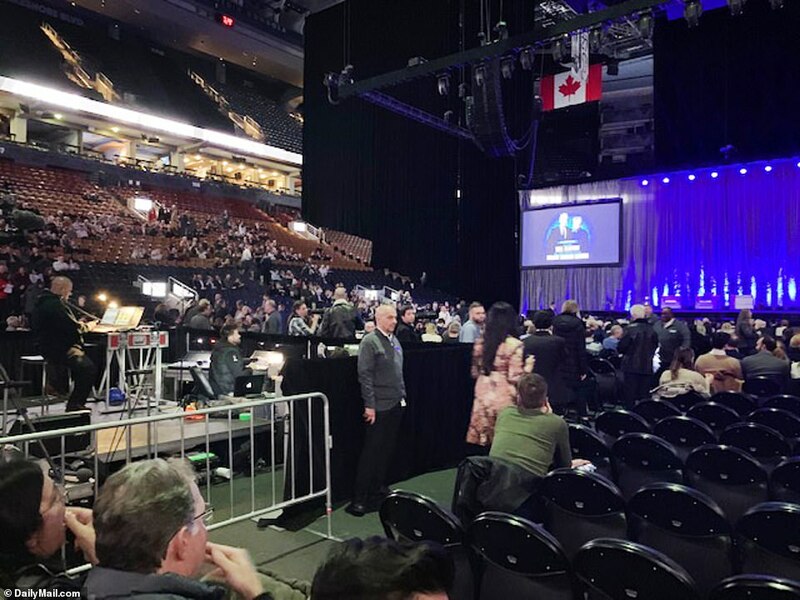 The former president and first lady launched their tour in a Canadian hockey arena last Tuesday to an underwhelming crowd and swaths of empty seats. 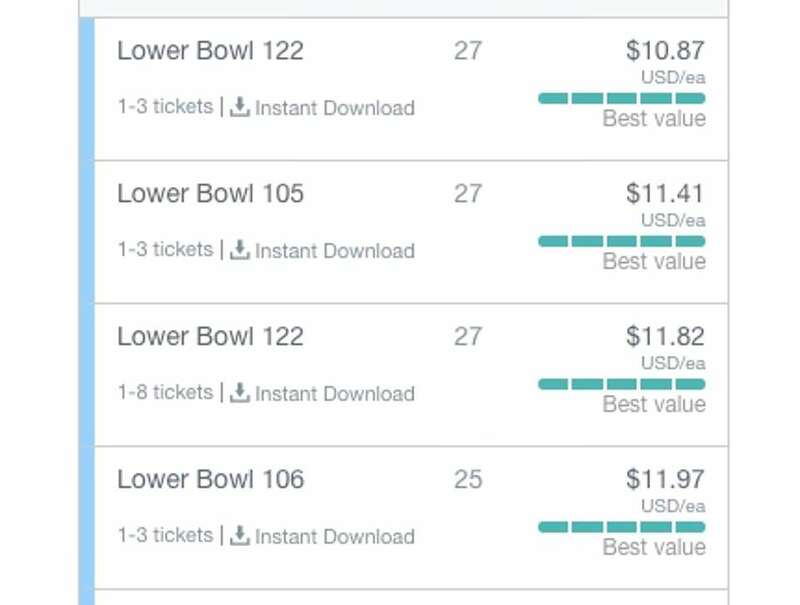 Ticket prices were plummeting shortly before the event, with the cheapest seats selling on Stubhub for single-digits - $6.55 Canadian Dollars, or less than $5. Now the couple are taking drastic action to avoid another embarrassment on the next stop on their An Evening With the Clintons tour. They have slashed tickets by up to 60 per cent, and even offered them on Groupon, to try and entice more fans to come and listen to them speak. On the official site, there were still seats for the tour available for up to $325, with other floor seats going for $83 plus a hefty service charge, but on Groupon, they can be picked up for as little as $35. The tour is currently on a break for the holidays and reconvenes in New York on April 11, 2019, before moving on to nine other cities including DC, Boston, LA and Las Vegas. For their May 19 show at The Forum in Inglewood, California, – which seats more than 17,000 – tickets usually priced at $77 are now going for $35, with $120 tickets discounted to $50, and $175 seats down to $72. 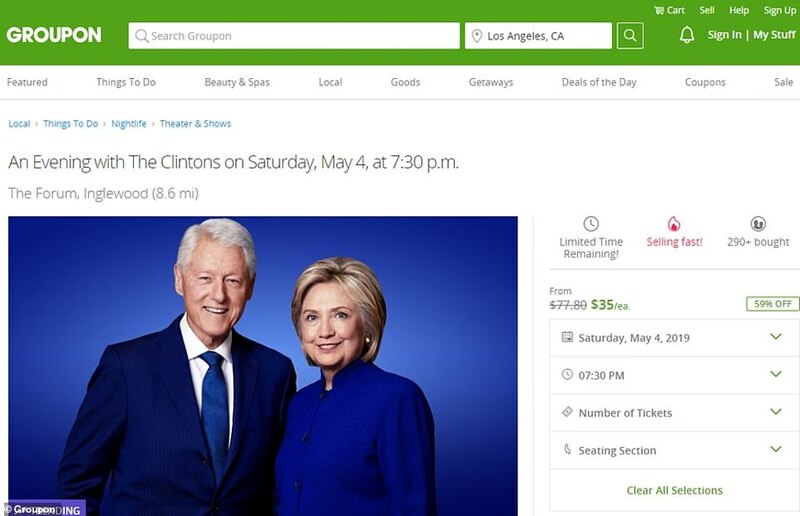 A Groupon deal for the Clinton's talk is for the liberal stronghold of Los Angeles where one would imagine the political power couple should be able to pull in the numbers. New York Times columnist wrote in an op-ed that it was 'curtains for the Clintons': 'I'm still looking at large swaths of empty seats — and I cringe at the thought that the Clintons will look out and see that, too. It was only four years ago, after all, that Canadians were clamoring to buy tickets to see the woman who seemed headed for history,' Dowd wrote. 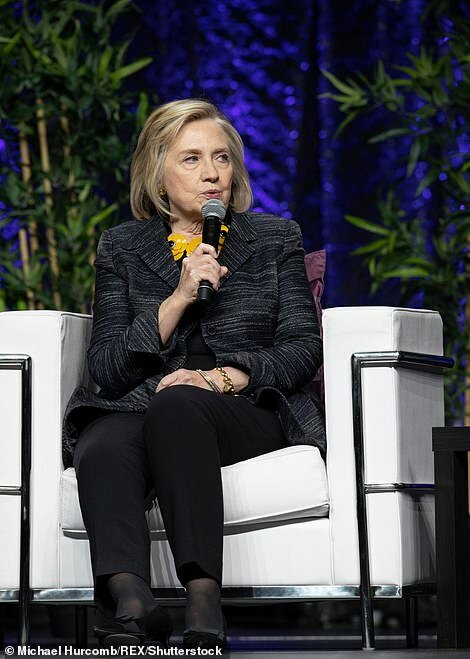 'I can't fathom why the Clintons would make like aging rock stars and go on a tour of Canada and the U.S. at a moment when Democrats are hoping to break the stranglehold of their cloistered, superannuated leadership and exult in a mosaic of exciting new faces,' she continued. 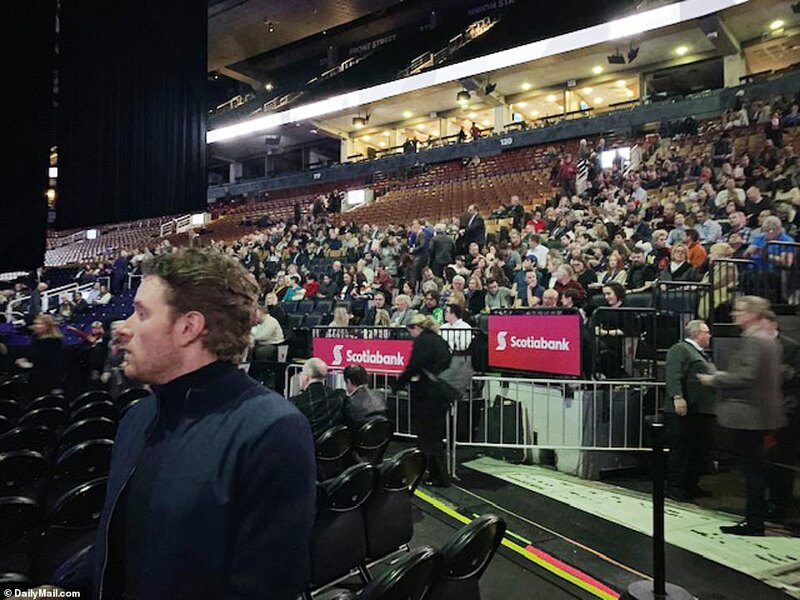 In Toronto, organizers blocked off the upper deck of seats. 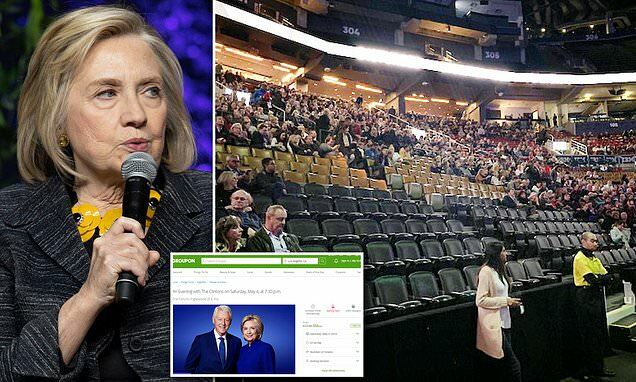 Officials said the Clintons sold about 3,300 seats in a venue that can hold about 19,000 for a big hockey game when the Maple Leafs play. About 1,000 people bought closer seats on the floor. The power pair were seated on two upholstered chars on stage, with low lighting and a mixing board in the back – a simple setup that also helps to keeps costs down. The Clinton's took heat during Hillary's 2016 campaign for their $153 million in paid speeches dating back to 2001, drawing fire from Bernie Sanders, Donald Trump and in media reports. But those events were bankrolled by major corporations, not individual donors who are ponying up to see the famous pair together on stage. 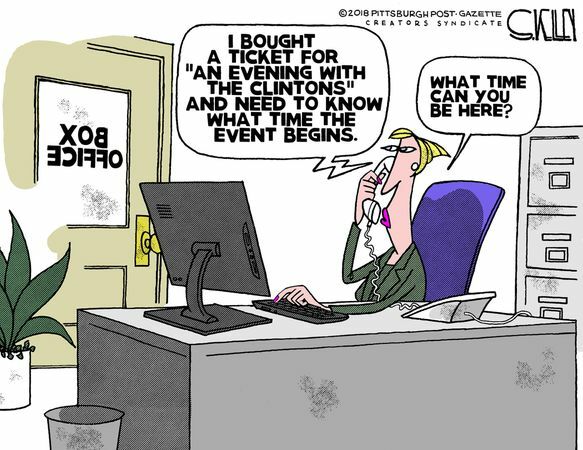 Their next scheduled 'Evening with the Clintons' event is not until April 11 in the firmly Democratic territory of New York City. 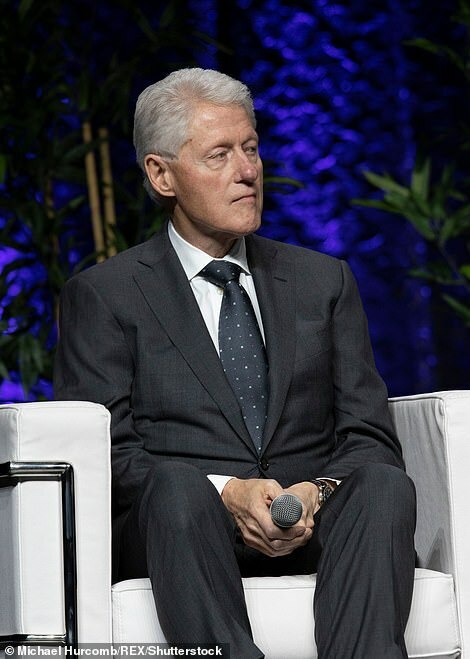 During last week's engagement, the Clintons riffed on issues ranging form the U.S. elections to the Iran deal, the killing of Osama bin Laden, and the murder of Saudi dissident Khashoggi, and got a warm reception from the crowd as they jabbed at the Trump administration from north of the border. time for them to relish their roles as grandparents, especially "Her"
What's next? Hiring vitturd/woodturd as Crooked Hillary's next campaign manager? Why do they believe they are relevant ? I think it is an ego thing! Smart move. He's never lost a campaign in his life don't you know.